The term comes from Italian word nepotismo, which is based on Latin root nepos, meaning nephew or grandson. Since the Middle Ages and until the late 17th century, some Catholic popes and bishops, who had taken vows of chastity, and therefore usually had no legitimate offspring of their own, gave their nephews such positions of preference as were often accorded by fathers to son. Several popes Pope Alexander VI. Alexander then elevated Alessandro Farnese, his mistress's brother, to cardinal; Farnese would later go on to become Pope Paul III. Paul III also engaged in nepotism, appointing, for instance, two nephews, aged 14 and 16, as cardinals. The practice was finally ended when Pope Innocent XII issued the bull Romanum decet Pontificem, in 1692. The papal bull prohibited popes in all times from bestowing estates, offices, or revenues on any relative, with the exception that one qualified relative (at most) could be made a cardinal. 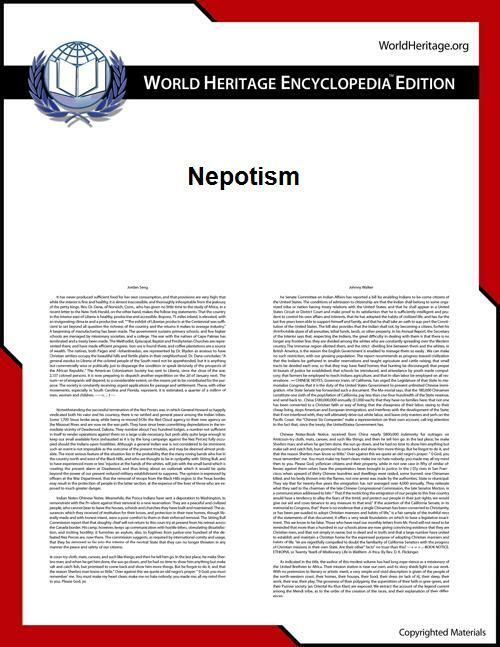 ^ a b "Nepotism." Dictionary.com. Retrieved 20 June 2013.